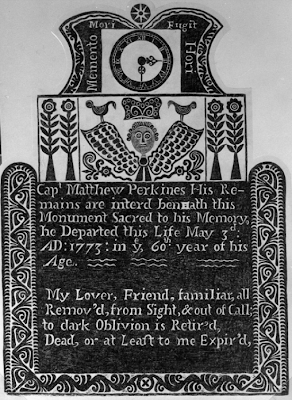 Vast Public Indifference: Where is the Matthew Perkines Gravestone? Hanover, Connecticut is a tiny village — so tiny that I only recently learned of its existence, which is extraordinary when you consider that I grew up less than 12 miles away. In my defense, Hanover is not an actual town — it's one of the three villages that make up the town of Sprague, which, with a population of nearly 3,000, clearly needs to be subdivided into more manageable municipalities. Anyway, my point is that Hanover, CT is very small. If you ever happen to find yourself at the intersection of Salt Rock Road and the Baltic/Hanover Road, you will see half a dozen unspectacular houses, a horse pasture, an adorable little white church, a playground, and a postage stamp-sized graveyard full of Josiah Manning's granite gravestones. According to the Farber Gravestone Collection, the Perkines stone should be there, so I dragged Pete way out into the boonies to look for it the last time we visited my parents. There are only about 100 stones in the Hanover graveyard and we could not find this one. I really hope that the answer is #1 or #2, but given the Perkines stone's beautiful and unusual iconography, I fear that #4 may be a possibility. Wow. Seems like we've begun to depart from the Puritan tradition a bit in the versification. Fascinatingly, Google identifies about five gravestones, all from 1770s to 1790s, with that verse, but they are the only citations: no literary source is apparent, and it appears nowhere else. I really wonder where it came from.